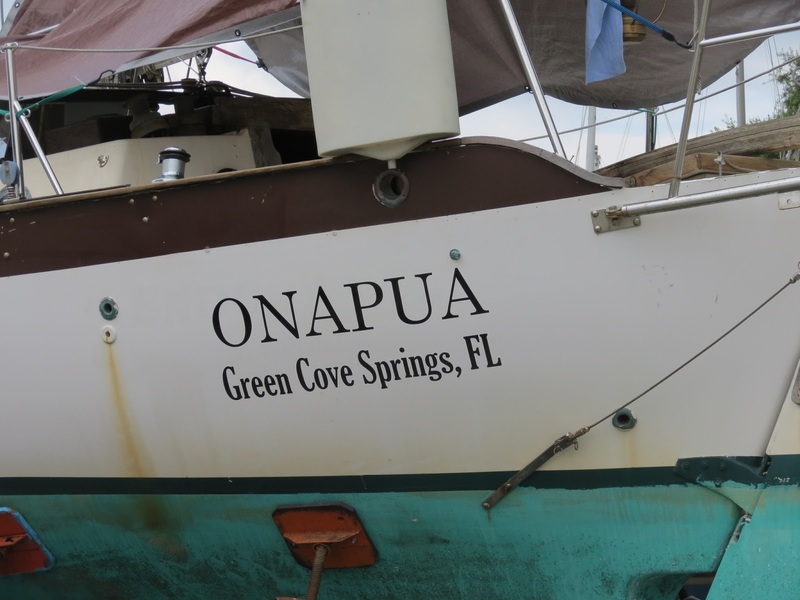 Onapua........the sailing vessel: Day 5....already? Goodness me. Time flies when you are having fun. I had a very successful day today. You never know from one day to the next just how it is going to turn out. When I came down here I decided that instead of picking out the projects that I wanted to tackle like in May, I would just cherry pick the ones that were the easiest to do. Last night there was an advertisement on the bulletin board here at the marina for some sails for sale. 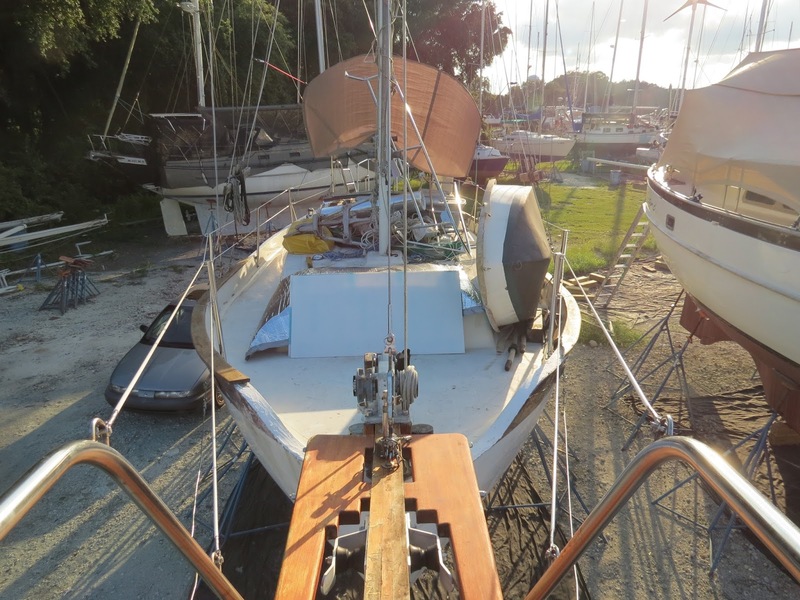 Now when I bought the boat, there were basically 2 sails on-board; one a Yankee head-sail and an older main sail. The Genoa was shredded in tropical storm Beryl. Now as with everything nautical, sails are very expensive. It would be nothing to spend a couple of boat bucks on a mainsail. Word of clarification.........One boat buck is a thousand dollars. So going into this I decided that I would buy a new Main sail and try to pick up some used head-sails. Ideally I wanted a good large Genoa, a storm jib, a tri-sail and a drifter. I had looked around with pickings small but managed to pick up a very good but small head-sail back in June. This morning my prayers were answered. Jim was getting rid of sails from a similar sized boat he lost in Hurricane Fay. Fortunately I am not a superstitious person, otherwise I would be running a mile. He sold me 3 very good sails for $200. One a full size Genoa, an excellent storm jib and a spinnaker. Now I have had some bad experiences with spinnakers and I really don't want one, but this one is pristine so I couldn't say no. I will bury it in the bilge and bring it out when I get desperate. When I got back to the boat from buying the sails, I was approached by one of the marina staff about speeding in the marina. Not good. It is true that I have a heavy foot. So I am on notice to reduce my speed to 5 mph. 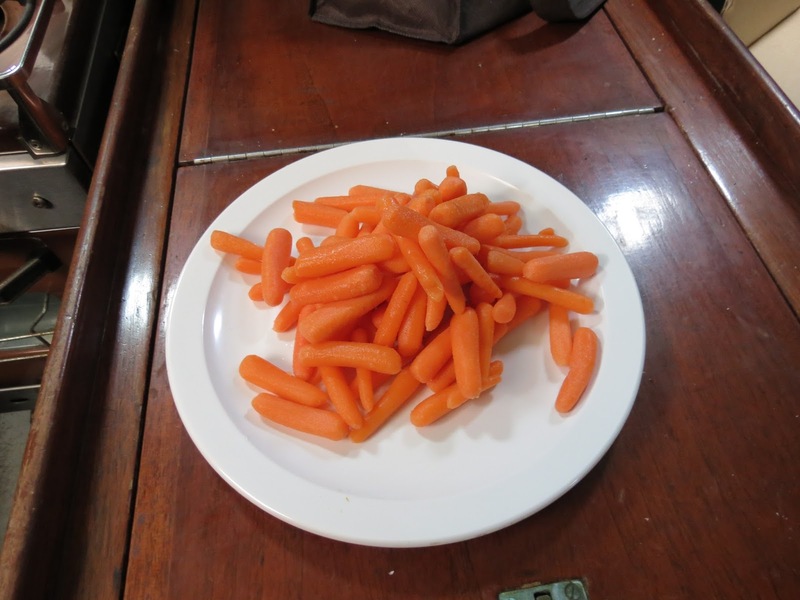 Here is my humble pie for lunch. 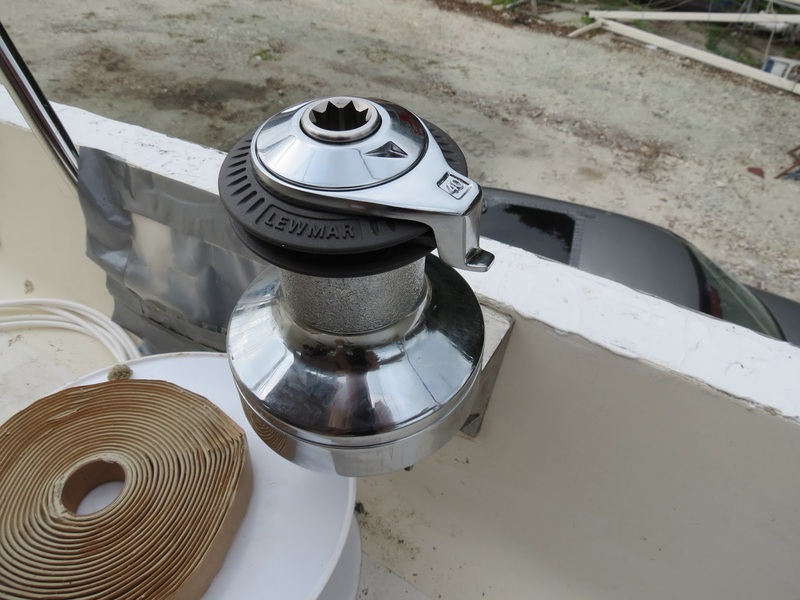 I needed some bolts for my new winches and I visited Steve here at the marina and got them installed finally. Those little babies run a boat buck each. I had been waiting for the wind to drop so I could install the other boat name. Time was of the essence! Everybody who walks by the boat now has to have an explanation of the meaning of Onapua. I have found that if I tell them it is my stinking wind they just keep moving. I dropped my lifelines off at a marine shop locally to get them swaged and when I came back later he said he wouldn't do them because he didn't want to be held liable in case something happened. 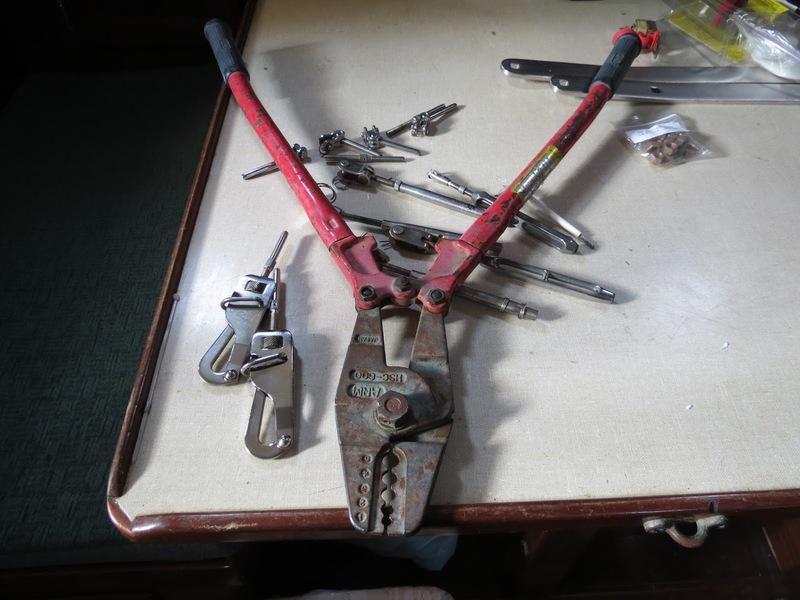 However he kindly lent me the crimping tool. So after 16 swages, the boat is starting to look a bit more ship-shape.